Snake in the grass no longer applies. 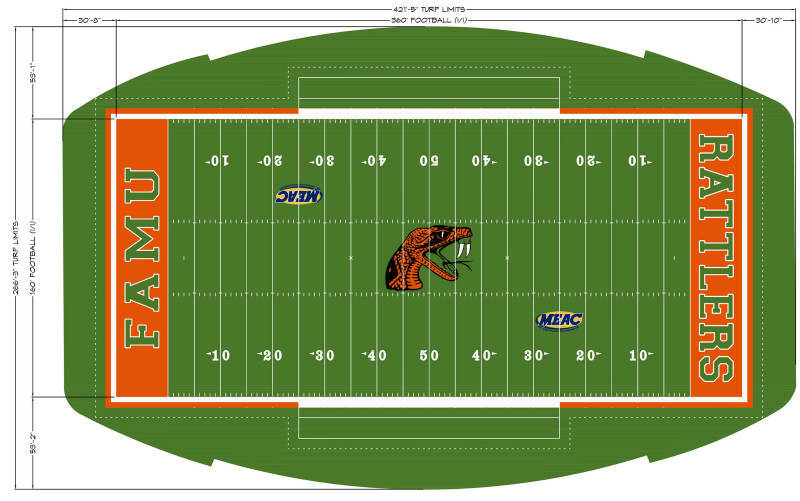 TALLAHASSEE, Fla. (June 26) – The Florida A&M Department of Athletics announced today that it is installing Astroturf in Bragg Memorial Stadium. The process has begun and it will be installed in time for the Sept. 1 opener against Ft. Valley State. The turf that is being installed in Bragg Stadium is currently installed at Boston College, Oklahoma State and Camping World Stadium in Orlando, to name a few venues. Eugene Bragg coached the Rattlers during the early 1930s and 1940s. Renovations: Expanded press box, press box elevator, the field was lowered by six feet to accommodate the drain and sprinkler systems, two electronic scoreboards were added. The Rattlers 2019 schedule is set.